Ready to establish an EB-5 regional center in Sunnyvale or the surrounding area? With EB5 Affiliate Network’s State of California Regional Center, you can maximize the entire Sunnyvale area, including nearby neighborhoods and cities. Discover more about affiliating your EB-5 Sunnyvale project with EB5AN right now and get started immediately. Get affiliated with EB5AN’s State of California EB-5 Regional Center and take advantage of multiple benefits. Don’t wait to raise investment capital for projects in the Sunnyvale area. When you have EB5AN’s Sunnyvale regional center in your corner, you can optimize one of 15 USCIS-designated immigrant investor regional centers managed by EB5AN. Take a look at the full list on the USCIS website. Our regional center offers complete coverage of the state from Sunnyvale to San Diego. Why wait? Start raising capital for your Sunnyvale EB-5project. Give your investors more cushion. When you affiliate with an EB5AN regional center, you’ll get the best of both worlds: direct and indirect job inductions that all count toward the 10-job requirement within the EB-5 program. If you’re not affiliated with a regional center, you can only use direct jobs (such as when you have a direct payroll employee). Don’t lose out on indirect jobs, which make it easier and faster than ever to meet those job requirements investors require. This leads to more investors bringing more investment capital. Expert help is at your fingertips. There’s no reason to go on this journey alone. The EB5AN experts are always available when your project is affiliated with our regional center. Enjoy full-time professional help and get an answer to every question quickly and efficiently. Why miss out on a full team of experts who can help you pinpoint how many jobs your project can create? Know exactly how much capital you can raise with their help. Enjoy a complete proposal overview and get peace of mind knowing you’ll meet affiliation requirements. Find out more about the benefits of affiliating withEB5AN’s regional centerin Sunnyvale and even more perks of affiliation. Get your I-924 application started today by contacting us. Your EB-5 regional center approval is right around the corner, and we promise to respond within 24 hours. Did you know an EB-5 regional center can take months of adjudication for approval? 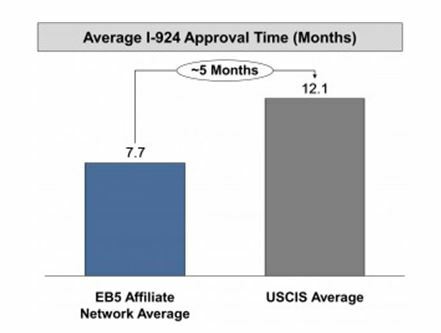 EB5AN has developed a reputation around quality and speed, so your application can be approved five months faster. Wait—is my project in a targeted employment area (TEA)? Find out easily using the TEA Designation page. Simply search for the Sunnyvale address you are eyeing and quickly confirm that your EB-5 project is located in a TEA. Already selected a TEA for your Sunnyvale project? Discover even more information with the Free EB-5 TEA Map. Now that you know you’ve identified a TEA for your Sunnyvale project location, it’s time for the next steps.You’ll require a TEA certification letter from your EB-5 TEA state agency. Get more information on requesting this letter at the How to Get a TEA Letter page. Plus, sample letters are available along with a full list of required materials so that you can easily complete your request. We’re happy to answer any questions, so get in touch today. Call us at 1-800-288-9138 or email us at info@eb5an.com . Responses are guaranteed within 24 hours. Located close to San Francisco and part of the heart of Silicon Valley, Sunnyvale offers countless things to do that attract both tourists and investors. From the thrills of California’s Great America to hiking in Rancho San Antonio, there’s something for everyone in this slice of California. Located in Santa Clara County, everything from the beach to the mountains are just a quick trip away. Sunnyvale is also a great place to raise a family. It’s turned many tourists into locals, especially thanks to top-rated restaurants nearby and gorgeous landscapes. Sunnyvale’s a veritable hot spot for startups and entrepreneurs, and it’s quickly becoming one of the most-desired areas in the Bay Area. With a population just under 150,000, Sunnyvale is the seventh most populous city in the San Francisco Bay Area. It’s also a major player in the Silicon Valley region, making its average income quite impressive. The average income is currently hovering between $110,000 and $120,000, and it’s expected to keep growing each year. Get started on your project right now by contacting us. It’s never been easier to open your own EB-5 regional center or affiliate with the EB5AN State of California EB-5 Regional Center.